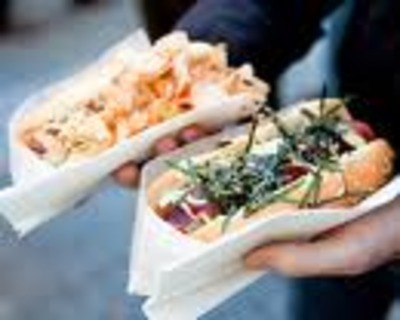 In 2005, Noriki Tamura, a businessman from Tokyo, moved to Vancouver where he opened a hotdog stand unlike any others. His creation, Japadog, combines a typical western fastfood – the hot dog – with flavors from Japan (daikon, seaweeds, etc.). At Japadog, even fries have a Japanese twist (soya is one of the three flavors of fries). I decided to try Japadog since this culinary delight only exist in Vancouver. For my first visit, I tried the least risky Japadog: Temaki (that’s the one on the right on the photo). Beef sausage. Mayo. Seaweeds. Mmmm. Very Good. You can’t actually taste or smell the seaweeds (which are similar to the seaweed used in sushi) so it tastes like a real hotdog, but of better quality. I liked it a lot (5/5). In fact, I liked it so much that I’ve decided to challenge myself to try ALL the Japadogs on the menu, one by one, and report on each one of these experience on my blog. Since I started by ordering Japadog #1 from the menu (temaki) I decided my next order would be #2: okonomi. Description: pork saussage, Japanese mayo, bonita flakes. To find out what bonita flakes taste like, come back and visit soon. This entry was posted in Uncategorized and tagged Japadog by oldpondcomics. Bookmark the permalink.